A bit of Flash Fiction for Mondays Finish the Story. You may be inclined to think I do these Flash challenges because I’m a dullard and can’t think of my own blog posts without a prompt, and you’d not be entirely wrong. Yet, I also do it as I might do sprints if training for a long run–focusing closely on form and whatnot (I’m not a runner, so not sure why I’m using this analogy) for that short distance in order to use that later in my marathon (um, the sprint is the 150 word Flash, and the marathon is my novels…get it?). Alright, enough intro. Here’s the story. 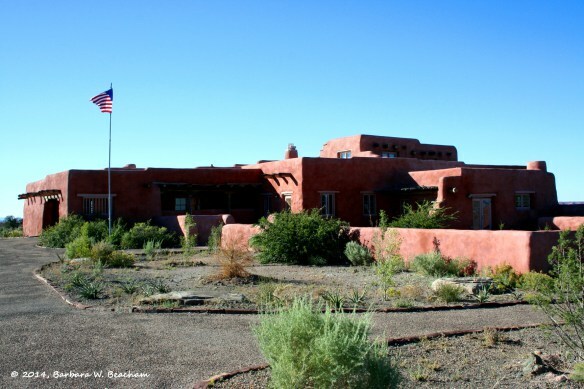 The house of Don Francisco sat in a remote part of the desert. Yet, he still flew the flag—this was Texas after all. “Mi amore, I’m going out to raise the stars and stripes.” He let his wife know what he was up to, even after forty years, because that was love. As he stepped out into the chill of the desert morning, he caught movement in the scrub. A flash of reddish fur and a clever eye told him who it was. The coyote stared for a stretching moment before sliding away to disappear into the desert. They were shy creatures, not ones for conversation. Francisco gazed out at the red and yellows of the land, thinking how this was once Mexico, and before that, home to the Pueblo. But at the very beginning, it was home to coyote. That made him feel good. This is a lovely little slice of life in the desert. It sounds like he has a happy and contented life! I think it’s great when people from all over the world get together to produce different viewpoints on a photo or whatever. I enjoyed theis warm friendly thoughtful post so much~Thanks for the pleasure Mara~ Short flash bites such as this need no explanation~Brilliant! Thank you! I am so encouraged by your and others comments–I won’t be so shy about giving Flash its due on my blog, and not trying to short-change it with justifications of why it’s “good for me to do”. It’s just good. Period. Oh I thoroughly enjoyed your take on the photo. What a well written story and totally to the left of what I would imagine. Great job! Thanks so much! I really like reading little unexpected “slices of life” myself, so perhaps am drawn to that when I write. This is written in the way a short story should be written… a brief moment captured, much like the snapshot itself, and through the dialogue and his inner monologue digs deep into a much bigger story.. Thank you for sharing this moment. Thank you so much, Bjorn. It’s so encouraging to hear that people enjoy my writing, even when it’s a little scene of 150 words! I thought this sstory had a beautiful air of gentleness about it. Well done Mara. Thank you Summerstommy. I was imagining the quiet of the desert in the morning that the picture inspired. I’m glad the feeling came through. You have included some interesting background detail in this short piece, both historical and environmental. And I really like the one-sided conversation with the coyote. I love it. Thank you Millie. Do you ever do these very short challenges? It’s amazing how long they can take to create, but I feel they really improve my ability to fine-tune a scene. I’m really interested in the idea of writing short sections of Flash Fiction, Mara. They look like a lot of fun. I just hope I can find the time to actually write something every week, as well as ‘getting on’ with my next book. What happens if I can’t come up with the goodies? As you say, even such a short piece can take some time. Thanks Susan. I’m glad you enjoyed it! I do Daily Creates across multi media platforms and IMHO, they need neither apology nor explication. Like this little slice, they are their own excuse fir being.